Chains have been on the mind recently. Of all of the components on a bike, I think one would be hard pressed to find one as under-appreciated as the chain. The chain is directly responsible for transferring all that torque when one pedals, to spinning the (rear) wheel. As bicyclists, we are told that roughly every 2500-3000 miles we should spend 20-50 bucks on a replacement. To go longer than that, one risks unnecessary wear on the more spendy parts on the drivetrain (cassette, chainrings etc..). My very own Park Tool CC-3.2! If you are anything like me, arbitrary numbers like how many miles before service, is a rule that I aim to break (just ask the people that change the oil on my car). I want to make sure that when I actually do replace any components on my bike that they are actually in need of replacement. There has to be a measurement (I am a chemist by trade), that indicates that a chain is in need of replacement. Enter the Park CC-3.2 ! For 11 dollars, I now know when a chain has worn .5% or .75% or more! What exactly does that mean and why do I care? All of the aforementioned torque provided by the muscles in ones legs is pulling the chain apart ever so slowly. One link on the chain is being pushed by one tooth on the cassette. At the same time, one link is being pulled (same direction) by a tooth on the chainring. Speed things up, all of the teeth on both the cassette and the chainrings take turns as do the links on the chain (as you pedal). 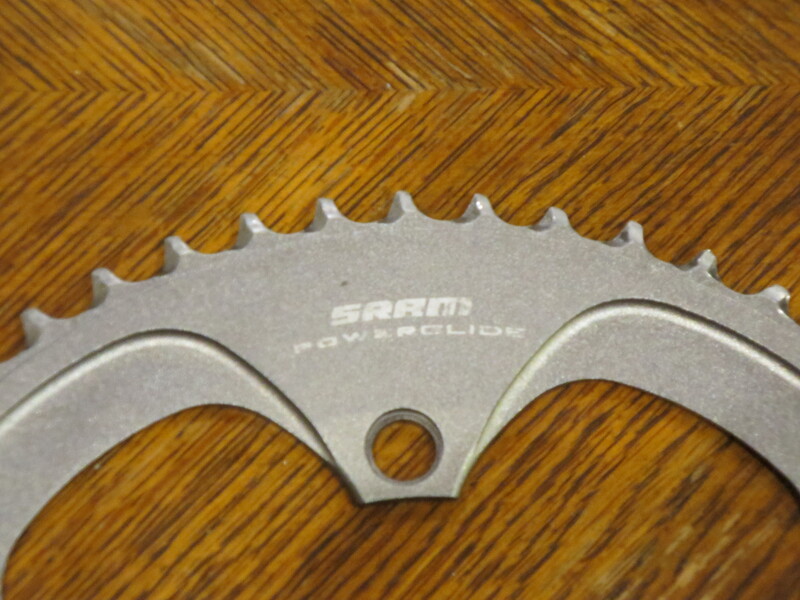 Ever wonder why the smaller chainrings tend to wear out faster than the larger ones? One of the main reasons is because there are less teeth to take a turn before they are up again! 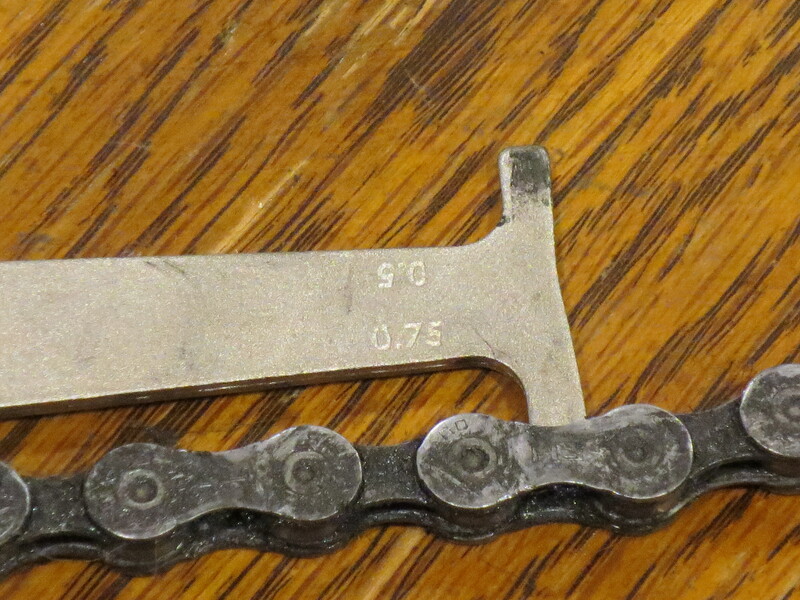 After putting the chain in the 0.5% of the Park Tool CC-3.2 Chain wear indicator, we see that the chain has stretched at least 0.5%. The very same chain, we now test for 0.75% wear. Since it is not a fit, (it doesn’t notch down), we can conclude that the wear of this chain is somewhere between 0.5% and 0.75%. The first couple thousand miles the chain can handle the pushing and pulling no problem, but eventually that poor chain relents and starts to give in and stretch. It only has to stretch 0.5%-0.75% from its original length before it is trash. Why you might ask? Well, suppose you ignore the rules and keep riding, whats the big deal? Lets suppose the chain has now stretched 1% longer than what it started as. Now, each link in the chain is linking up with the teeth on the cassette and chainrings 1% away from where it started. Remember before how we learned how robust chains were? Well, this is intentional and the result of the chain being constructed of extremely hard, brittle metal alloys. Harder than those used on both cassettes and chainrings. Slowly after time, in the battle waged between the chain, and the cassette or chainrings, the chain will “win” and start to wear the others to this new stretched pattern. This mere 1% shift in chain alignment begins to manifest itself in ways such as sloppy shifting and jumping cogs. 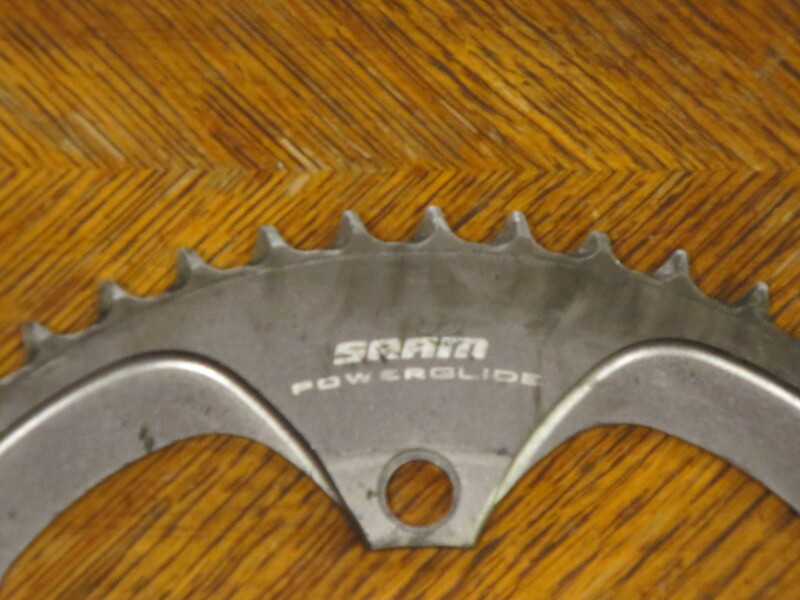 Here is a worn chainring. This came off a friends bike. He was having some skipping and his shifting was not smooth-this was a culprit. Eventually, the wear will get to the point where the chain, cassette, and chainrings will all have to be replaced simultaneously, as all have worn to the imperfections of each other. Think of it as an old group of friends or drinking buddies, that have been meeting up weekly over the years. Do you really think a newcomer could break into that? 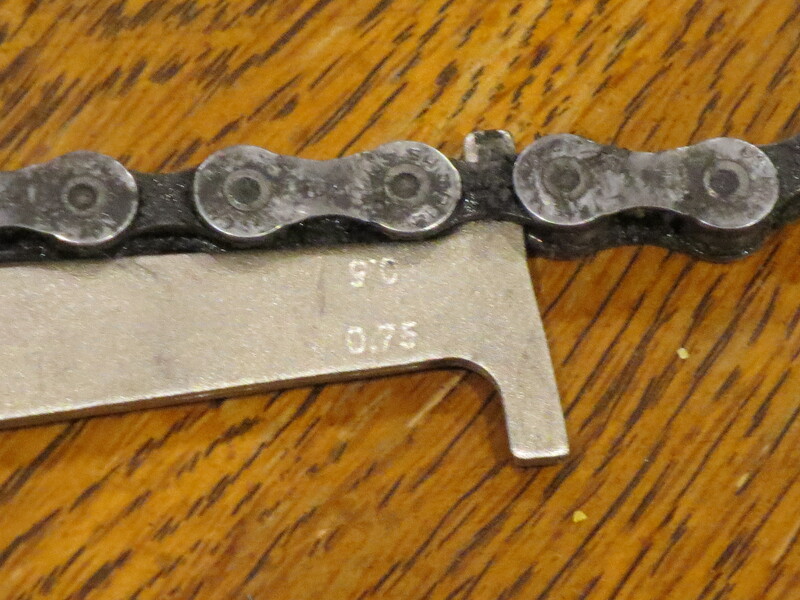 In summation: Check your chain for wear periodically! Sure, be a rebel and go a couple extra thousand miles (I do every time I get my oil changed), but if you are going to push the envelope, get yourself a Park Tool CC-3.2, and be aware of the potential consequences. 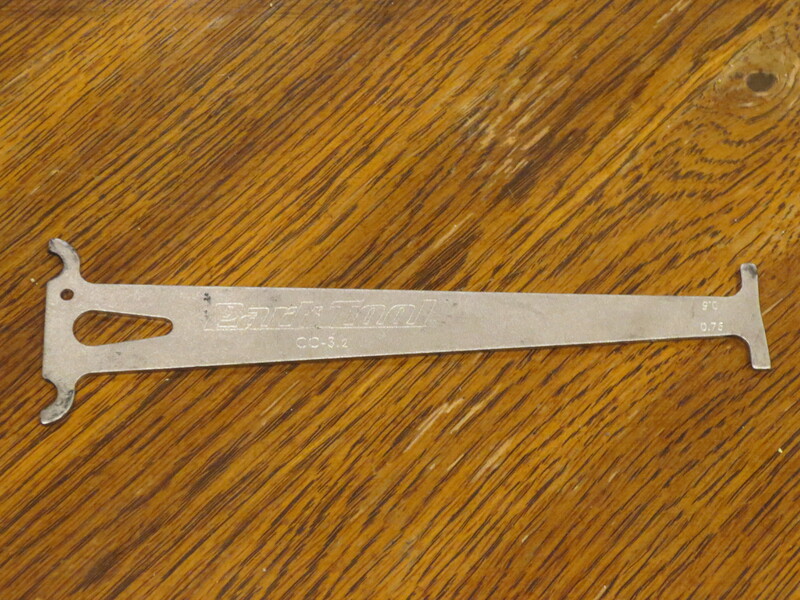 UP NEXT: Eager to use my new chain wear tool, I find that Jenica’s dad is in need of new chains on both of his bikes. We are going to install them and make sure that both shift like new when we are finished. Stay Tuned!